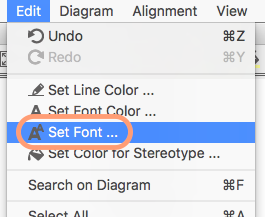 You can now change the font and font-size for each object from the [Set Font] icon or from the top menu [Edit] – [Set Font]. The “Gap Expander/Remover” tool is now available in all diagrams except Mind Map. Gap Expander allows you to expand a canvas to insert elements where you want, without changing any existing object’s layout or formatting. After you insert elements, you can use Gap Remover to reduce unnecessary space. The Navigation line appears while moving all the objects. It is now thicker and brighter for better change visibility. An autosave feature is now available. Autosave protects your data from a machine crash or freeze, saving both your data and time spent on it. Configure the autosave interval and determine how often you want to autosave: [Tools] – [System Properties] – [Files]. Turn on autosave mode from the tool menu. 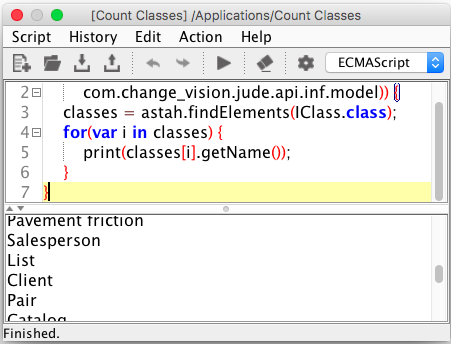 The new Script Editor is revolutionary; this feature expands Astah’s capabilities enormously! The script editor allows you to access models via a scripting language with an API. This allows you, not only to create and modify models, you can also perform any operation that the API allows. Actions such as extracting models by specified conditions, listing models with specific stereotypes, applying object name changes by related models etc. are all possible. You can add as many features as you need by saving the frequently-used scripts. Here are some sample scripts to help you get started! Go to [Tools] – [Script Editor] to open the Script Editor. Place your script on the top pane and run. Now [Tools] – [Java] – [Import Java] can import source code in full-width characters. Improved rendering performance when scrolling and using the zoom features on the Map view and the diagram editor. The UI has been improved for the property view. All text menus are turned into icons to simplify and maximize the size of the property pane making it easier and faster to input model properties. An improved alert message now appears when an exception error happens at Astah’s launch to guide you to a better solution. It is now easier to find Astah’s updated information to save time. An improved [License Management] dialog can be opened from [Tools] – [License] to give you better navigation to pricing pages. The following shortcut keys have been changed since version 7.2. 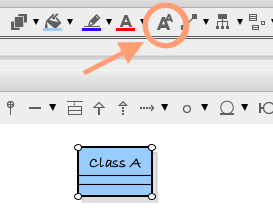 Now you can turn stereotype visibility on or off from the [Initial Visibility] tab of the Class Diagrams’s property. Check the on/off the box then click [Apply to existing elements]. 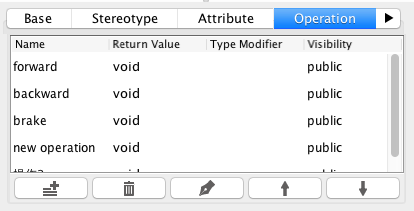 You can change the default setting for this from [Tools] – [System Properties] – [Initial Visibility 1]. You can add stereotypes to Requirements from the Requirement’s context menu or from the [stereotype] tab of the property view. 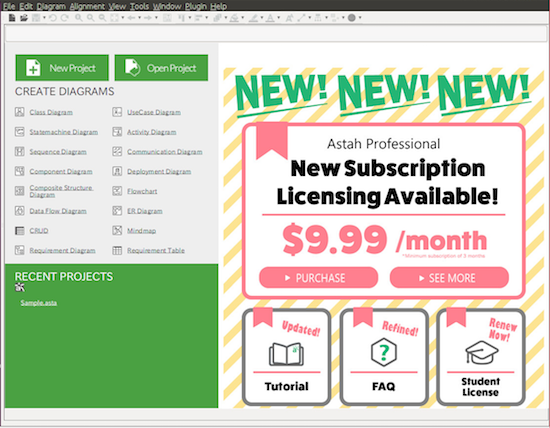 A new startup screen is available for Linux so you can get the latest information about Astah. Sometimes [Text] model does not appear on the diagram and throws an exception error. Upon connection/disconnection of external displays or projectors, Astah freezes. <<use>> dependencies were exported as Implementation when exporting from [Tools] – [Java] – [Export Java]. Diagram scrolling was too sensitive on Mac OS Sierra. Incorrect license information appeared on [Help] – [Version Information] dialogue. StringIndexOutOfBoundsException would occur when adding mmodels a hyperlink any files. HSV label were duplicated on Color palette. When you export diagams to image files, mini-icon were cut off. Upon connection/disconnection of external displays or projectors, the screen resolution changes on Mac. Sometimes Activation of Organizational license failed when it cannot access the volume serial number. Some labels were missing from tool palette (e.g. 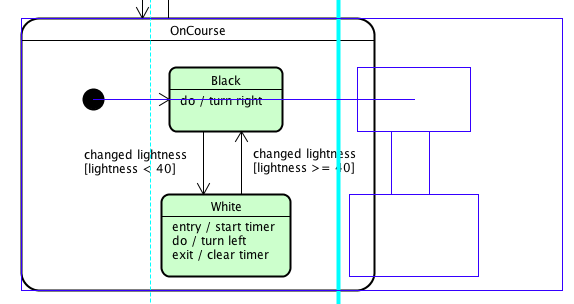 UseDependenciy, Realizations on the Class diagram’s tool palette). Java crashes when opening a file chooser (when opening a file, saving…etc). Sometimes model elements attached to the container (e.g. entry point on state) were deattached from the container when moving. Changing the hight of the property view automatically switches the currently-open [tab]. [Correct Invalid Model] does not delete invalid constraints that have lost their target models. Cloning models throws an exception error if the model includes an Association class with its association role and association class. Altering partition width would change the location of model elements. “Free Hand” element does not change its location when partitions are added, deleted or resized. Sometimes you cannot move the location of labels of Entry and Exit points. Some labels on [Add ER Domains] were not appearing correctly. Altering the Child key of Non-Identifying Relationship in the property view does not sync models on the diagram. Dialogue opened by [Tools] – [ER Diagram] – [Export Entity Definition Report] – [New Template] has wrong size. Adding Attributes to ER Entity clears the taggedvalue of its child ER Entity’s attribute. Turning off [Formura] checkbox on ER attribute’s [Base] tab does not clear all the necessary information. Copy and paste of Mind Maps would fail if the Mind Map was created using the template that came with version 7.0 and earlier. Sometimes loading Mind Maps would fail when opening an exsiting project file. Astah API Sample applications would not run in some directories. It is unable to set “Icon Notation” via API. Inapporiate warning appears when compling one of API sample applications called “csvexporter”. Some icons and arrow images appear too small on the [Tools] – [Java] – [Import Java] dialogue on high-res display. Size of all the buttons on the top right of the [Compare Diagram] screen is too small on high-res display. Size of Astah window is too small when launching Astah for the first time on the high-res display. Astah icon in Unity launcher does not appear clearly on Ubuntu.